Easy Documentation: Does Anything Even Use That Index? I don't know if it's ever happened to you, but I always find myself wishing I had documented what the devil I was thinking when I added an index to a table. I mean, it's all well and good to create an index, but it's annoying when six months later you can't remember what it was for. Is anything actually using this index? Can I maybe drop it? Yes, yes, I suppose I could document my indexes, and I suppose some people do that kind of thing... but it just seems like so much... work. Wouldn't it be cool if there was a way to automatically document which stored procedures use which indexes? And how many times each procedure used each index? And when the last time that was? 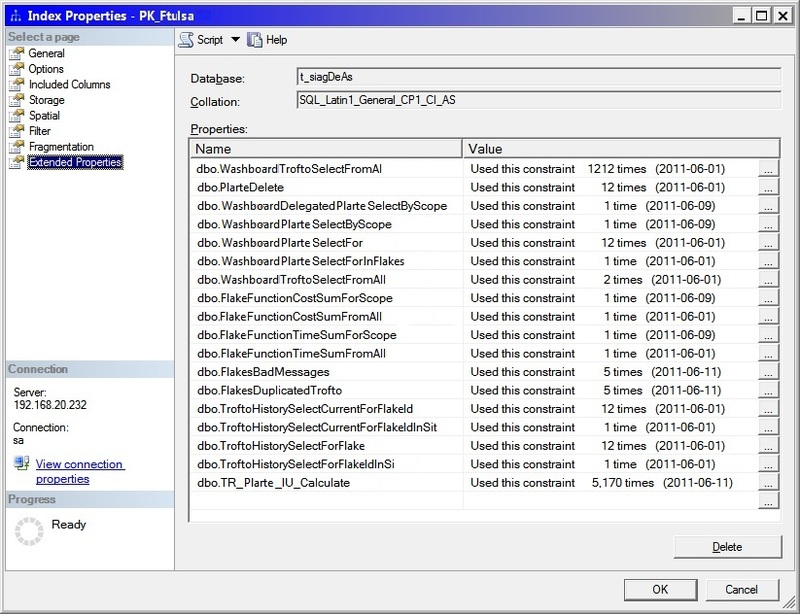 And was integrated into SQL Server Management Studio, and all this with no work required on your part? Of course it would be cool; so here it is. In this post, I'll just present the code, and what it will do for you; I'll walk through it in my next post. Briefly, this script examines the current and cached query plans, and parses the info we want out of them; then it adds extended properties to each index. After you run this script, your indexes will have extended properties like this, one for each stored procedure that uses it. Of course, the index had to have been in the query plan cache to show up here; since the script only takes a few seconds to run, I have a job that runs it every so often. Over the long run, all the indexes eventually get found in the cache; it just depends on how often your various applications run. Note that the date in each extended property is updated every time the script is run. 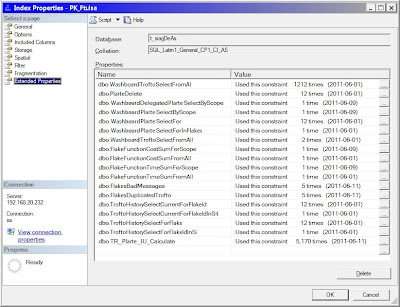 -- each stored procedure is added to the corresponding index(es). -- investigation. Don't drop indexes based solely on the usage of this script. -- We don't want to kill some other process doing real work. -- Variables. None of these should need to be changed in normal use. DECLARE @ExtendedPropertyValue    NVARCHAR(3750) = ''       -- The value of an extended property is a sql_variant value that can contain up to 7,500 bytes of data. AND t.type_desc NOT IN ('SQL_SCALAR_FUNCTION')          -- Added to as I find them. AND ep.minor_id = 0                                                              -- 0 means on the index, not on any columns. -- Now that we've created the SELECT statement, iterate it through a cursor. -- Build some values we're going to need. -- If the index name is new, create a display heading for it; just for readability. -- If the value hasn't changed, nothing to do. -- Update any existing one. -- Done with this extended property. -- leave a transaction open. You can verify this by examining the @@TRANCOUNT value. -- If  1, the transaction is committable. -- If -1, the transaction is uncommittable and should be rolled back. -- If  0, there is no transaction and a commit or rollback operation would generate an error. -- If this is a deadlock, the rest of the indexes on this table will probably deadlock too. -- Skip to the next table. -- continue - this will cause an abort that displays the error message.